Pizza can be the perfect companion, both when you are alone or with friends and family. 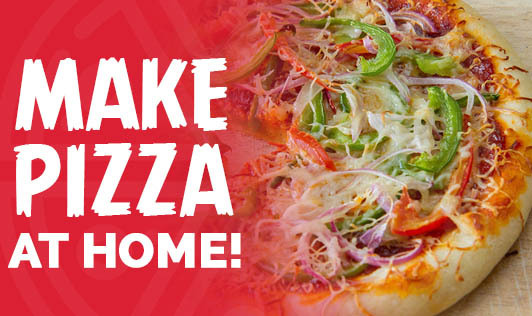 It is so easy to just dial a number and order from the wide variety of pizzas that is offered by numerous outlets. But, have you thought about how fun it could be if you made it at home with your family or with your friends on a night out? Here is the recipe to make pizza at home. Enjoy! • Combine warm water and yeast in a small bowl and keep aside for 5 - 10 minutes. • In a big bowl, add flour, salt and herbs. Slowly add the yeast mixture and make dough. Add more water if needed. • Knead it into soft dough and keep aside in a warm and dark place for 30-60 minutes to rise. • Preheat oven to 200oC. • Divide the pizza dough to equal parts. Spread the dough to form medium sized pizzas (you can either spread it with your hand or use a rolling pin). Make sure that the pizza base is of medium thickness. • Sprinkle rava on a pizza stone or line a baking tray with baking sheet. Place the pizza base on the tray. • Spread tomato sauce on the base. Spread the vegetables on top of the sauce and sprinkle little cheese. • Bake it for 15-20 minutes or till golden brown.